To live in a tiny house, especially if you want to live off-grid, there are a lot of things you have to think about that you might never have considered before. One of these things is what to do with your waste water. There are two types of waste water: black water and grey water. Black water is basically the sewage water from your toilet. RVs tend to store this waste water in holding tanks until it can be deposited at a dump station. 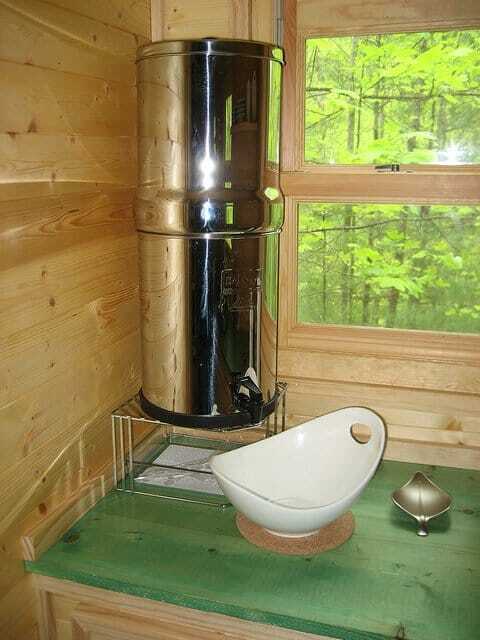 Due to weight restrictions, storing water in this way in a tiny house is difficult, and many tiny house owners opt to use composting toilets instead of traditional toilets, solving the black water issue. But what about grey water? Grey water is the non-sewage waste water that comes from bathroom sinks, showers, and washing machines. As long as it hasn't come into contact with faeces, it's probably grey water. Grey water is dirty in the sense that it likely contains soap, bacteria, hair, dirt, food, lint, grease, and household cleaning products, but it's clean enough to be reused. While releasing this kind of water into bodies of water such as lakes would pollute them, plants and trees can filter the water and use its contents as fertilizer. This is great news for tiny house owners because it enables them to both get rid of their grey water and minimize water waste at the same time. How Do You Recycle Grey Water? The next piece of good news is that grey water systems can be very simple, both to construct and to use. Essentially, all you need to do is redirect your waste water into your garden, so that it goes straight to the plants it's going to water. Once you've got the all-clear, it's best to have your grey water run outside straightaway, as storing it can cause the nutrients in it to break down. Don't ever store it for longer than twenty-four hours. It's also important to ensure that the water does not come into contact with any humans or animals on its way to the plants, just in case it is contaminated. You don't want your pets thinking it's drinking water! You may need to play around a bit to ensure that your grey water goes straight into the ground, without pooling. It would also be a good idea to consider the types of plants you have, and to look into how much water they need and how often, so that you don't accidentally drown them. Finally, once your grey water system is set up, make sure to only use natural, biodegradable household products such as soaps and cleaning products in your tiny house. You don't want to put anything toxic like bleach or dye down your drains, because doing so will pollute the plants and soil outside. 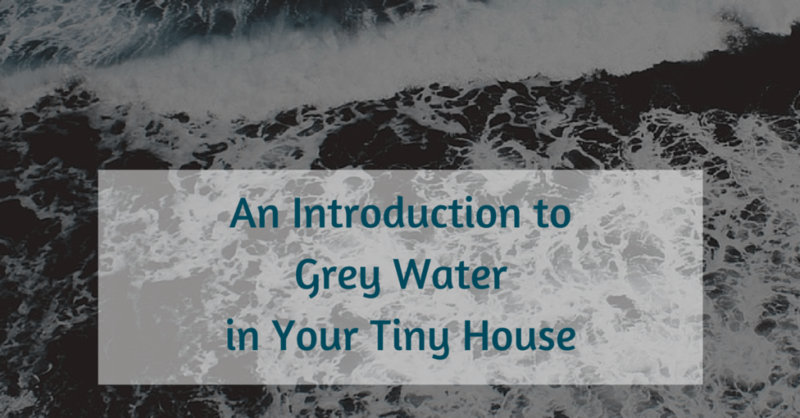 There are several different methods you can use to get rid of your grey water. The simplest way to start reusing your water is to place a bucket in your shower or under your sink. Then simply take the water-filled bucket out and water the plants with it. Alternatively, if you do have a standard toilet, you could use this water to flush with. This method doesn't involve reusing your waste water, but if you happen to have access to a sewer or septic system that's not at capacity, you could just send your water there. It's not a very environmentally-friendly solution but it's probably the simplest. If you create more grey water than the plants can take, you can create a wetland to dispose of the excess water. A wetland can be a pond or marshland that filters most of the impure particles out of the water and leads it to where it's needed. 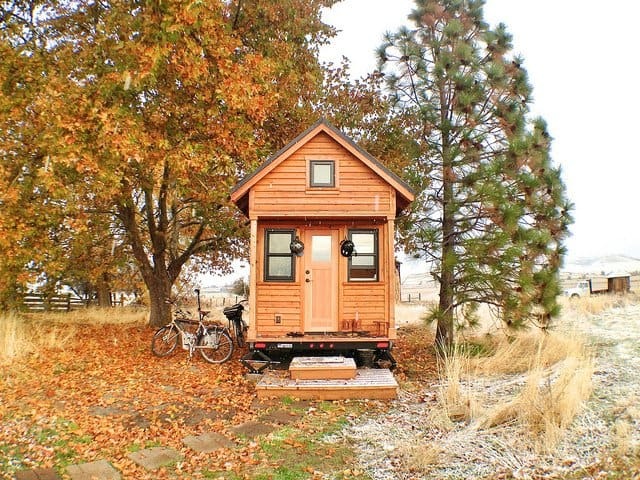 Of course, this option is only available to tiny house owners who stay put. It can also be a more expensive option, as you may need to buy a pump and a filter. 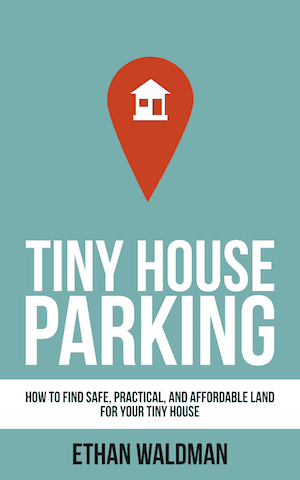 If your tiny house is parked near a slope, you can use gravity to filter your grey water. Simply position some buckets going down the slope at intervals, and direct the water through those buckets. This set-up should cost you under $100 and doesn't require you to do much to the land you're living on. Another simple but less environmentally-friendly solution is to store your grey water in a portable water tank and to dispose of it elsewhere. This solution is far from ideal, and you would need to consider tank size and portability, and how often you would need to empty it. Another option is to drain your water into a surge tank (a large drum or barrel), and to have it slowly drain out of a hose connected to the bottom of the tank. You can place your tank on cinder blocks to enable gravity to help the process. For this option to work, you may need to find a way to secure the tank and the hose. 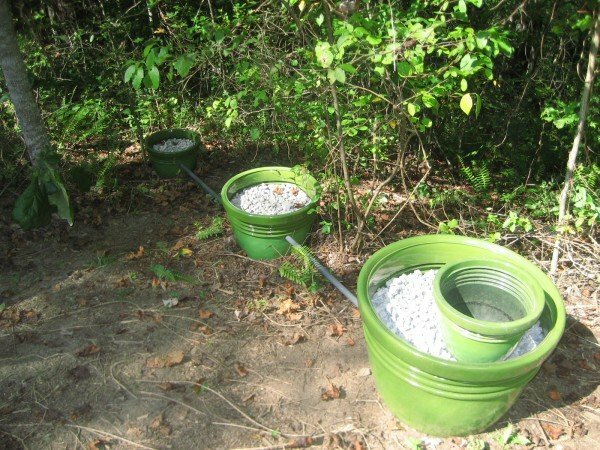 If you're living permanently on a piece of land, you could install a branched drain system. With this low-maintenance approach, the water uses gravity to flow through a drain that splits into smaller branches and into a mulch basin. While this method isn't the best for filtering grey water, it is ideal for distributing it over a wide area. If want to use your water to feed lots of smaller plants rather than one bigger one, this could be your best option. That said, this system is harder to install. Alternatively, you could try to create a DIY branched drain system, by using a garden hose manifold connected to more hoses to distribute your water in the same style. How Are Tiny House Dwellers Dealing with Grey Water? 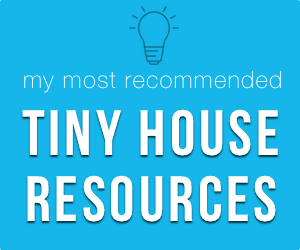 While all of this information might sound a bit overwhelming at the moment, rest assured that plenty of tiny house owners are using grey water systems with no difficulty. Laura LaVoie from Life in 120 Square Feet uses a fairly simple system. Under her shower drain, there's a bucket that collects not only the shower water but also all of the sink water she uses for cleaning (hands, teeth, crockery, etc.). Once a day, she takes that bucket to a wetland, where potted irises filter the water before it goes back into the ground. You can read more about her system here. Tammy Strobel from Rowdy Kittens also uses a basic grey water system. Under her tiny house, there's a container that can store five gallons of water. Water flows from her kitchen sink and wet-bath into a pipe that leads into this container. The water is then used to irrigate the shrubbery and trees outside. As Laura and Tammy's systems demonstrate, grey water systems do not have to be complicated. 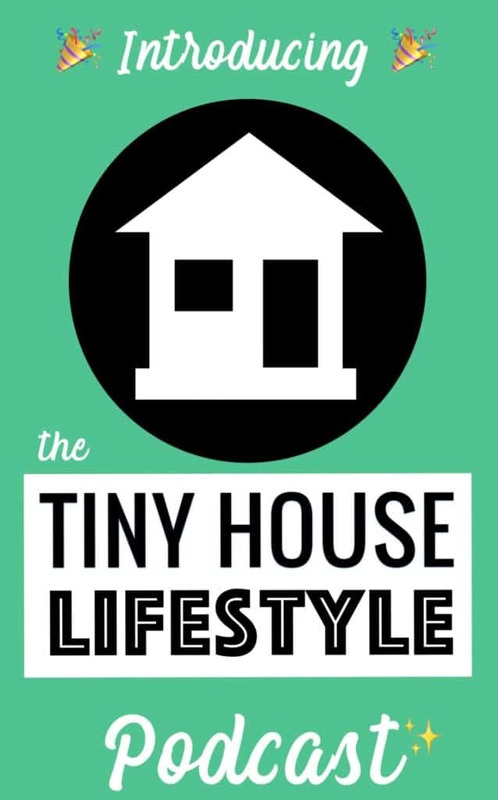 There are a range of options available to tiny house owners, and the most commonly used methods seem to be the simplest, cheapest, and most portable ones. 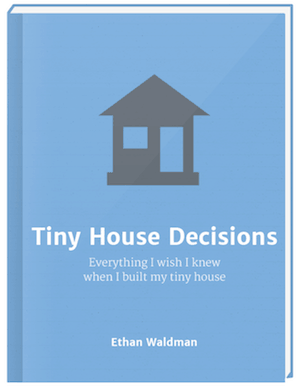 Whether you live in your tiny house in one place or you move around, you should be able to create a system that works for you.